Did you know you can freeze bananas? Literally just drop them into the freezer, peel on. Then when you have enough bananas, simply take them out and let them defrost. The bananas will be the perfect texture (use the liquid that comes out of them too). So now you don't have to worry when you have just one or two bananas beginning to brown; stock the in the freezer until you have enough to make a banana bread (you could however, make a banana semifreddo with just one or two) - but either way, there is no need to throw them out. The recipe below is versatile enough that you can make a banana bread or a banana muffin. Fold in nuts or chocolate chips for a fun twist, which I love. Know your eaters though - some of these muffins were for my friend Heather, who is allergic to walnuts. So I made the nut-less muffins in the photo for her. 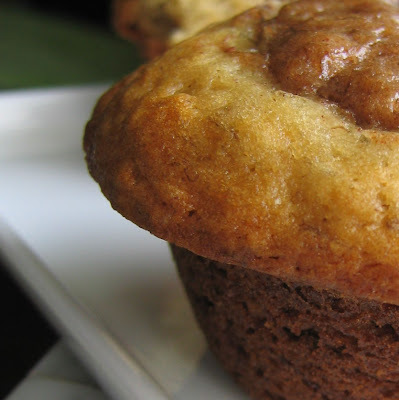 Freeze your next left over bananas and make some banana bread or muffins today. You'll love them just out of the oven and you'll have a fat and happy breakfast and afternoon snack. Tips and techniques: Top the banana bread loaves with chopped pecans and brown sugar or turbinado/raw sugar. If your using the classic loaf pan- pour into your well greased loaf pans, place in preheated oven (375 degrees) for about 45 minutes- or until an inserted toothpick comes out clean. 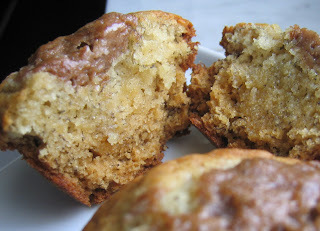 If your using muffin pans: fill each well-greased muffin pan about 1/2 full; add a dollop of the extra banana filling mix (recipe below) into the center of each, and then top with another layer of the main mix (of feel free to just top each muffin instead of hiding as a filling). This extra filling will boost the banana flavor and help keep these little muffins moist!